After the barbaric story we have all followed of Jamal Khashoggi and his horrific murder at the hands of admitted Saudi agents, we can see a growing campaign on the part of Middle Eastern governments to intimidate, frighten, and ultimately neutralize prominent critics. This sometimes includes the less barbaric, but likewise criminal attempt to cut people’s reputations into pieces in order to terrify them into silence. The United States must take strong action to protect its citizens and residents from Middle Eastern governments that wish to silence them. Unfortunately, numerous worldwide governments have failed this test, routinely apprehending the very citizens they are meant to protect before meting out brutal interrogations or extraditing them to criminal states. During World War II, Nazi Germany dispatched secret police forces to hunt down known or suspected dissidents — a tactic aptly termed Nacht und Nebel (Night and Fog) to describe the darkness that surrounded the victims’ sudden disappearance. During the Cold War, the Soviet Union earned a brutal reputation for summoning or detaining men and women only for them to then disappear forever. In Iran, this seems to be a problem on repeat: following riots in 1999, 2003, 2009, and even this year, hundreds of Iranian protesters — most of them students — were detained, with dozens yet to be so much as located. Just last week in the Middle East, another man disappeared; this time, he was an American citizen. A Palestinian-American who, according to Arab-language media reports, is named Isam Jalal Akel, lives in Jerusalem and was discreetly apprehended by Palestinian Authority (PA) police. His arrest has been something of a shadow play. The Palestinian Authority did not disclose their detainment of the man to Israeli military and police commanders, as they’re required to. In a sharp break from international diplomatic protocol, even the American embassy wasn’t informed of the arrest, though the man holds an American passport. And what was his “crime”? Doing business with a Jew. He had been involved, it is alleged, with the sale of a home in East Jerusalem to a Jewish buyer. In the morally skewed universe of the Palestinian Authority, that is, quite literally, a capital crime. Since then, the law has been further clarified. The term “positions,” as it turns out, refer to any sort of land or real estate. “Transferring” has been elucidated by PA President Mahmoud Abbas to include any act of “diverting,” “selling,” or even just “renting” a property. As for the “enemies,” this refers to “an enemy state or one of its subjects,” which, coming from the PLO, refers explicitly to Jews. The law has been reaffirmed by Palestinian officials on several occasions — in 1973, 1979, 1997, 2010, 2014, and 2018. 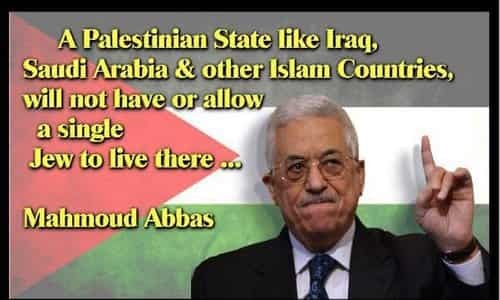 But the truth is that this kind of Jew-removal goes back farther than Abbas, the PLO, or the Jordanians: it is reminiscent of a series of laws enacted in Nazi Germany in late 1930s, to other acts of discrimination in Europe and the Arab and Muslim world for centuries. After the Oslo Accords, the Palestinian leadership could legally kidnap those suspected of dealing with Jews. In 1996, the newly-minted PA security forces were accused by Israel of kidnapping and killing alleged land dealers. That year, the disappearance of 70-year-old Farid Bashiti, accused by the PA of selling property to Jews, made international headlines. His family was told by Palestinian officials that he died in a car accident, a lie that quickly came undone after he was found bludgeoned to death, with his hands cuffed and skull crushed. Farid was denied a Muslim burial, and his family was forbidden to erect a mourner’s tent. Yes, fear is what they are seeking to instill. And it is up to the United States and other governments around the world to stand up to this barbaric practice. Originally published at Algemeiner.com – reposted with permission. Why Did The Religious Leaders Reject Jesus Christ? Where Is The Israel STory Now – And Where Is It Going? How Did Muslims Suddenly Become "Palestinians?" Israeli Occupation of Arab Lands?